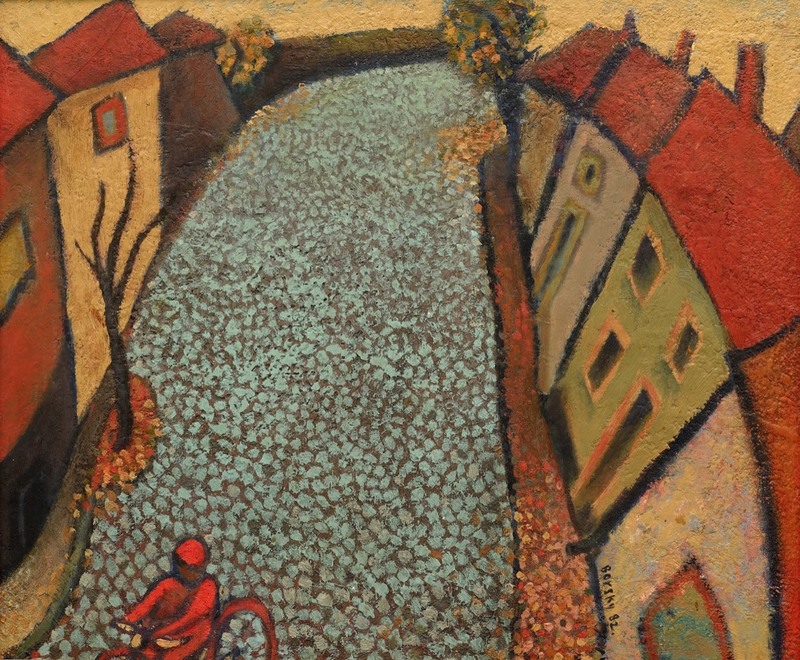 Jiri Borsky was born near Pilsen, Czech Republic (then Czechoslovakia), in 1945. At the age of 15 he moved with his parents to Prague, where he lived and studied for the next eight formative years. Among the early, and lasting, influences were the marvellous 14th century Czech Gothic panel paintings he saw at the National Gallery there. Jiri's first one-man exhibition was held in Malostranska Beseda, Prague, in 1966. Following the Soviet invasion in 1968, Jiri came to England. He married Patricia (née Garner) in 1972, and became a British citizen in 1975. 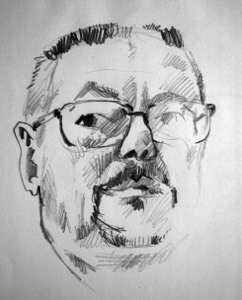 He enrolled to study painting (under principal lecturer Arthur Berry) and graduated with a BA (Hons) degree in 1979. His external assessor was William Gear. Since then he has painted full time. Initially he supplemented his income with teaching, but has concentrated solely on studio work in recent years. In his spare time Jiri enjoys organic gardening. Music (mainly jazz, but also folk and classical) is his passion and frequently inspires his work. Jiri has exhibited widely. Over 2000 of his works are in many collections in Britain, Europe, North America and elsewhere. "…the paintings are rewarding long after one’s first encounter with them, for Jiri Borsky is both a thoughtful artist and a man who takes evident pleasure in the craft of painting." "It is the human race, with all its varying facets, humorous or serious, explicit or mysterious, that provides Borsky with his richest subject-matter." 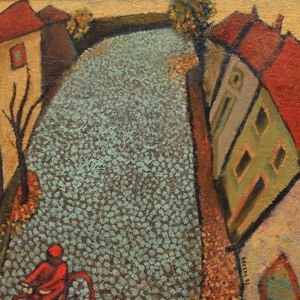 Despite the strong bond of Borsky’s art with his home environment, it is impossible to ignore its rootedness in European traditions, techniques and styles of painting. As an artist with deep regional roots, Borsky is also an internationalist, because he is at home in more than one place and style. I have always thought that there is a strangely benign tension at play in these paintings between the easily locally identifiable North-Middle-England dimension and a wider European perspective. For one, I suspect that Borsky’s paintings thrive on a fundamental similarity of environmental impulses he receives in the Potteries to the formative ones drawn from impressions of earlier life in his native Czech habitat, before he came here in 1969. In a way it is good to know that there is more than one place on earth that looks like us up here, a reassuring realisation which adds a reflective, comparative, generalising layer to his painting of the North Staffordshire experience. To give an example, the main feature in one of his paintings of 1982 (around when he started up in earnest as a painter here) called ‘The Hill’, is the main street of his native village in Czechoslovakia. This could easily be a street with houses in our own area, in Kidsgrove perhaps, or a backstreet of Tunstall. A local Potteries scene, that’s what I thought, and this was one of the reasons why I obtained the picture at the time (another was that it really appealed to me, because doubtlessly, as Borsky explained to me, “it is painted from the heart”). The fact, as I later learned, that the scene is actually based on the blueprint of a live-Czech experience does not diminish the pictures appeal, on the contrary! The Road up a terrace-house hill, with the houses in distorted perspective, like rows of faces, is painted cobblestone grey. A subtly stunning lighting effect is being employed: the grey of the surface gradually solidifies in an atmospherically blurry, hazy sheen, the further we follow the road up, away from the focal point of the cobbles, which are distinctly outlined in individual detail in the immediate foreground of the lower stretch. This gives the impression of shimmering air or silvery grey mist up the road, and the illusion of ascension into a distance uphill. From the forefront a half-captured cyclist in red disappears down the road – and ironically out of the picture, to the left. A humorously absurd note of gentle melancholy hangs over the scene, empty except for the half-disappeared cyclist. There are two interesting aspects to Borsky’s art that contribute to making it interesting and compelling, as I learned from looking more closely at this earlier piece. The possibilities for painted expression of local life provided in the North Staffordshire experience are reminiscent of the ones offered in his native land. Borsky’s artistic temperament is suited to the Potteries because it developed in a world with similar material features. Borsky is the artist that we know because our environment is inspirational in the same, or in a similar, way as the one he lived in before he made his home here. It fits the bill of his artistic disposition. The second thing I learned from ‘The Hill’ was to pay attention to Borsky’s international versatility, not so obvious perhaps in this on the face of it locally embedded artist. I see his artistic ‘internationalism’ as a natural consequence of this artist benefitting from calling home more than one place on earth. Even if I am in danger of reading too much here, I was then and still am when I look at the grey road of ‘The Hill’ taken with what I held was an implicit ironic commentary on the old technique of Pointillism in the Pissaro/Seurat Impressionist tradition. And the anthropomorphism of the face-like houses as they line the road as mute bystanders to the cyclist’s disappearing act, I thought, had an air of Expressionist Berlin stage set-design about them….